The Nordstrom Anniversary Sale is live for one more week and while many items are out of stock, there are still so many great deals available! 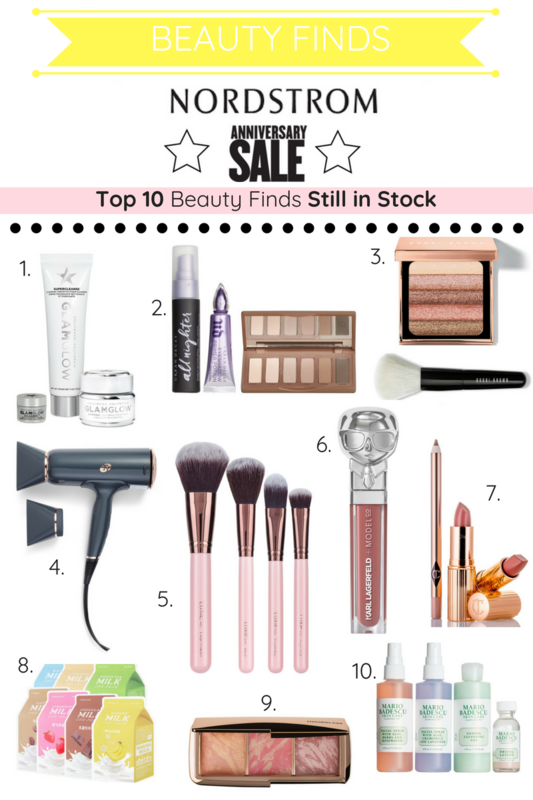 Today I am rounding up 1o of my favorite NSALE beauty finds that are still in stock and ready to shop! 1. GLAMGLOW Clear Skin Set ($59): This set comes with three products, the VOLCASMIC matte glow moisturizer, the SUPERCLEANSE cream to foam cleanser and the SUPERMUD face mask. This set was one of the first beauty items I put in my cart! I have yet to try the moisturizer or the foam cleanser, but this set is worth it for the face mask alone! One of my all time favorite masks, the SUPERMUD face mask works WONDERS! I swear by this when I’m having a breakout. This lessens the appearance of any zit (I’m even talking those giant, sore, bright red cysts) overnight, if not making them disappear altogether. If the other products are anything like the face mask, your skin is in for a treat with this set! 2. URBAN DECAY Naked2 Basics Set ($49): This 3 piece set includes everything you need to create a gorgeous eye that will stay put all day and night! These are 3 of my all time favorite products. I am a neutral girl through and through, so this eyeshadow palette is the BEST, filled with gorgeous, neutral shades. The primer potion does an amazing job of prepping and priming your eyes and helping the product stay put. Last but not least, the All Nighter Makeup Setting Spray is something I use on a daily basis to keep my face looking fresh. 3. BOBBI BROWN Mini Glow Set ($32): I am so excited about this palette! Gorgeous neutral shades paired with the prettiest shimmer. Use this to contour or highlight. I can’t wait to get my hands on this! 4. T3 Hair Dryer ($134): Before my T3 dryer, I always used a cheapie drugstore option and it just never got the job done. Not only did I feel like it took me FOREVER to get my hair dry, but felt that it was making my hair more brittle. The T3 dryer is efficient, cutting my drying time in half and is much more gentler. I feel like my hair looks better and feels better after using this! It’s also available in white! 5. LUXIE Face Complexion Brush Set ($35): I’ve been searching for new brushes to help me create that flawless look and am so excited about these! There are 4 brushes included in this set, a large powder brush, blush brush, foundation brush and a large fluff brush. These brushes are perfect for all of your products, from powders, foundations, blushes or concealers. Bonus? They are pink and so pretty! 6. KARL LAGERFELD + MODELCO Kiss Me Karl Lip Lights Lip Gloss ($28 – or buy 2 get 1 free): My favorite lippy of the summer is part of the sale! I did a whole post on my love for this lip gloss earlier this summer and it’s continued to be one of my go to’s! This lippy is super comfortable, goes on smoothly, dries matte and STAYS PUT! Plus it has a super fun feature…it lights up for application when opened! 7. CHARLOTTE TILBURY The Pretty Pink Lipstick Set ($60): Everyone’s favorite trio for creating the perfect pink pout is on sale! I’ve only heard rave reviews but have yet to try this product. It’s on it’s way to me though and I can’t wait to report back! It’s said to be one of the best matte options that hydrates and stays put. I can’t wait to try! 8. A’PIEU Milk Sheet Mask Set ($12): This assorted mask set is so cute, I just couldn’t say no and on top of being cute, they are supposed to do wonders for your skin! Each sheet mask contains different active ingredients that benefit your skin, like hydrating, soothing, nourishing, brightening, ultra-rich moisturizing, revitalizing and firming. This set includes 7 different sheet masks…Milk, Coconut, Green Tea, Coffee, Strawberry, Chocolate and Banana. This set would be a great Christmas present too…buy it now and that’s one less thing to shop for come December! 9. HOURGLASS Ambient Lighting Blush Palette ($65): HOURGLASS palettes are my favorite and this is no exception. A collection of 3 dreamy blushes that will give you a glow like none other. These light-weight and airy blushes give a multi-dimensional look that blows all other blushes out of the water. Do yourself a favor and snag this set! 10. MARIO BADESCU Latest & Greatest Set ($30): This set includes some of my all time favorite Mario Badescu products. I use the Drying Lotion on any pesky pimple and am always amazed at how it dries up overnight with this magical little potion. The facial sprays are my favorite for a refreshing pick me up that also hydrates and this set comes with two! Last but not least, the Enzyme Cleansing Gel is not something I have used yet, but am excited to try. It leaves skin bright and rejuvenated. Get all 4 products for just $30! There are so many great beauty scores in the NSale! Awesome picks, lady! I’m definitely going to shop beauty! Shopping beauty is my favorite part of this sale to be honest!